The ER-6ic has plenty to offer and whilst not strictly hi-fi, the advantages of custom fitting outweigh the limitations in sound quality. But be warned, the noise cancelling is so good you might not hear your keys falling from your pocket into the street. Noise cancelling is almost too good! Ear-canal headphones are nothing new, but Etymotic - who was the first company to develop commercial in-ear products back in 1984 - offers an appealing custom-moulded version of its popular ER-6i, tailor-made for your ears. The advantages of custom-moulded earphones are highly attractive - they offer unmatched all-day comfort, as well as significant 'natural' noise cancelling and, as a result, they can help protect your hearing by enabling far lower volume levels. Etymotic has teamed up with a company called ACS - a supplier of custom-fit hearing protectors and monitors for the music industry. Together, they've created a package that consists of the ER-6ic earphone, with a tailor-made earpiece all for £150. When you buy a pair of ER-6ics direct from one of Etymotic's suppliers, they send you the headphones complete with a voucher for your custom fitting session at an audiologist near you (customearphones.co.uk has a locator search). 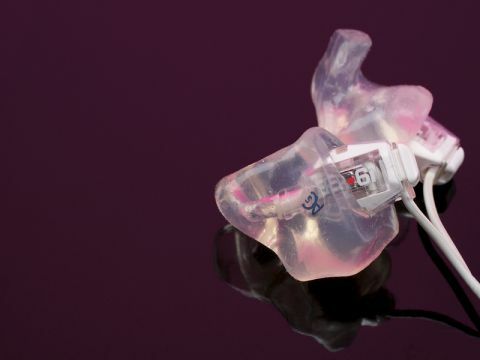 The moulding itself takes less than five minutes and your new custom-fit ear-pieces should follow 14 days later. When your new moulds arrive, you simply remove the old 'universal' adaptors and slip on your custom jobbies. It's worth noting here that ACS makes each piece by hand from medical-grade silicon and its customers include U2! Admittedly, the moulds take a while to get used to, and the correct insertion technique takes a few attempts to master. The 'proper' seal only comes through practice and experience, but once in, the fit is beyond compare. The ER-6ic unit itself is tiny: smaller than most rivals, for example, and about the size of a baked bean! But despite the compact dimensions, flyweight 30-gram mass and tiny drive units, Etymotic suggests the ER-6ic extends down to 50 Hz, and up to 16 kHz. Whilst this is clearly not up to audiophile standards, the product has, in fairness, been specifically designed for the less discerning portable user. third less in our testing. This direct connection between driver and ear canal is impressive - free from external influence, the ER-6ic is able to directly deliver the drivers' output to the ear. to bass performance, but even with ACS's custom-fit ear moulds (which aren't the culprit), the bass is disappointing. However, the ear quickly papers over the cracks and the 'benefits' become clear. Although lean, the ER-6i delivers impressive clarity. The moulds enable the units to reveal detail without being influenced by ambient noise. The effect gives a level of insight that's pleasing with music on the move. With bass held back, there is greater opportunity to hear into the music more, but your tolerance of this obvious sacrifice, will depend on your musical tastes. Forget dance. Overall presentation is a little thin, too, and you can't help but feel shortchanged compared to similarly priced models from Shure and even cheaper ear-canal models from Sennheiser and Denon. The saving grace of the package is, undoubtedly, ACS's custom ear moulds (which incidentally can be made for other brands). The comfort, natural noise cancelling and value for money offered from the moulds is exceptional and the package is only held back by the limitations of the earphone itself. That said, and despite having a number of 'on the go' headphones of all types available to test here at HFC towers, the ER-6ics remain alluring. They block out the world in a way that powered noise-cancellers can only dream of. And although they're certainly not hi-fi, we seem strangely drawn to them.